I’ve been a bit remiss with my posting lately. I wish I could promise that I’ll rectify this problem, but the truth is that my updates will most likely become more and more sporadic as Summer Reading draws nearer (and I’ll probably go on a full on hiatus in June and July…you’ve been warned). 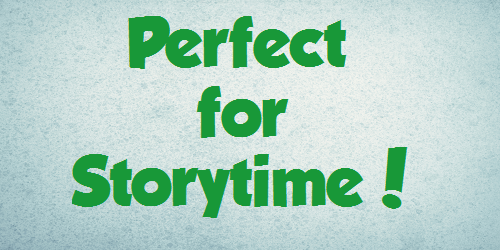 But it’s not summer yet, so here are a few books that are perfect for storytime! This wild romp of a book is perfect for any jungle themed storytime! Two orangutans wake up, craving a snack, in the middle of the night. They find some delicious mangoes in a tree, but when they reach for them, they lose their balance and the mangoes and monkeys come crashing crashing down and end up orangutangled! 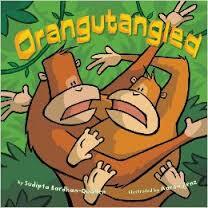 Several other jungle animals attempt to free the primates but end up being orangutangled as well! The illustrations, rendered in ink, brush, and photoshop, fit well with this silly story that kids will love. This book is short and simple, but would still be wonderful to share in storytime. Mole loves labeling things, but when he comes across an alligator, he doesn’t know what to label it. So he labels it many things, such as bumpy and lumpy and dangerous. The alligator wants to befriend mole (and, believe it or not, his reasons aren’t nefarious), but mole grows angry when the alligator continuously eats all his labels. In the end, they both apologize and mole gives alligator a new label: friend. The cartoonish illustrations are awash with bright greens and yellows, and the text is large enough to read easily to a group. But the best thing about this book is the vocabulary. Boba the baboon wants to take a picture of the tallest animals, the giraffes. But there’s one tiny problem — Geri the giraffe is much smaller than his friends, and it’s difficult to get him into the shot. They try stilts, a turtle tower, and even helium, to no avail (but some hilarious pictures result from it). Finally, a tiny caterpillar suggest that instead of raising Geri up to their heights, the taller giraffes should bend down to Geri’s height. This works perfectly and the final picture of the giraffes is the best one yet. The giraffes look a little silly, and the text can’t decide if it wants to rhyme or not, but overall this is a great story to share for a jungle theme, a big and small theme, or a theme about being a little different. This terrific book combines the concept of stop and go with construction! One day, little green said a word: Go! And the construction trucks woke up and got to work. But when there’s a little too much go and things get out of hand, little red steps in with a new word: Stop! They work together with hilarious results and a bridge gets built. And just as the cars start to drive over the bridge, little yellow rolls into town. I bet you can guess little yellow’s word! This book would work well with any construction, things that go, or movement storytime! Tiny rabbit wants to be big and strong, but the only thing that seems to be big for him are his ears. However, he soon realizes that his big ears are very useful because they allow him to hear all sorts of things — including a hungry lion. And his tiny frame is useful too because it allows him to hide from the hungry lion. The acrylic illustrations are adorable, although I’m not quite sure what forest animals are doing in a jungle animal habitat. Also, the text in this book is a little bit on the tiny side, which is appropriate for the story but it makes group sharing a tad bit difficult (but not impossible, especially if you practice beforehand).